In Seville, Spain on 26 June 2009, the 33rd meeting of UNESCO's (external link) World Heritage committee inscribed the Dolomites in the UNESCO (United Nations Educational, Scientific and Cultural Organization) World Heritage List, citing the beauty of the Dolomites’ landscape and the unique geological and geomorphological significance of these mountains. UNESCO inscribed nine mountain ranges – a representative selection of the Dolomites – on the list of “serial world heritage properties.” The term “serial” here means that although the mountain regions are physically separate entities, they represent a unified whole from the standpoint of their landscapes, geology, and geomorphology. The around 142,000 hectare areas encompass Bozen-Südtirol / Bolzano-Alto Adige, Trento, Belluno, Pordenone and Udine provinces. The World Heritage Sites in South Tyrol are Drei Zinnen / Tre Cime, Fanes-Sennes-Prags / Fanes-Sennes-Braies, Puez-Geisler / Puez-Odle, and Schlern-Rosengarten / Sciliar-Catinaccio Nature Parks, the Latemar mountain range, and Bletterbach river gorge natural monument. Inclusion in the UNESCO World Heritage List is the highest distinction for a natural site, a kind of world heritage property “Nobel Prize,” as International Union for Conservation of Nature IUCN (external link) consultant Gerhard Heiss so aptly put it. In order for a site to be included in the list of World Heritage sites, a thorough and meticulous evaluation is conducted as to whether the site meets UNESCO’s rigorous criteria. This includes, for example, determining whether the site is a genuinely one of a kind property of exceptional universal importance. Hence protection of this irreplaceable heritage is no longer the concern and duty of an individual state, but is instead incumbent upon humankind as a whole. Moreover, if such a site is damaged or seriously deteriorates, this would represent not only a loss for the site affected, but also for humanity as a whole. It is thus crucial to do everything possible to make people see how important and valuable the “World Heritage” distinction is. Protection, conservation and optimization of the Dolomites World Heritage Site need to become a shared cultural concern whose scope includes not only the actual world heritage, but also a new sense of responsibility for the entire Dolomites region. The successful cooperation among the relevant provinces during the candidacy phase showed the great potential of the Dolomites UNESCO World Heritage Site project in terms of (a) making the general public aware of the importance of sustainable development of the Dolomites; and (b) promoting understanding among the world’s peoples. In 1972 UNESCO (external link) (United Nations Educational, Scientific and Cultural Organization) adopted an international treaty known as the Convention concerning the Protection of the World Cultural and Natural Heritage (external link), which is the most important instrument that has ever been promulgated by humanity to protect its cultural and natural heritage. Im As at April 2009 the Convention had been signed by 186 states. The central tenet of the Convention is that some cultural and natural heritage properties are of exceptional importance and thus need to be preserved as part of the “world heritage” of humankind. By signing the Convention, the signatory states obligated themselves to (a) protect, optimize and preserve the World Heritage Sites that lie within their borders for future generations; and (b) engage in cooperative international efforts and provide mutual aid for purpose of achieving this aim. On inscription of the Dolomites in the World Heritage List in July 2009, the List contained 890 properties in 148 countries around the world: 689 cultural properties, 176 natural properties, and 25 mixed properties, which are classified as both cultural and natural heritage properties. There were 44 Italian World Heritage Sites on the list at the time, two of which count as world natural heritage sites: the Dolomites and the Aeolian Islands. The UNESCO World Heritage emblem represents the interplay between cultural and natural properties, whereby the square in the center symbolizes a man-made form and the circle symbolizes nature. The two elements intermesh. The emblem is round like the Earth, but at the same time also symbolizes protection. Only those properties are inscribed in the World Heritage List that the World Heritage Committee feels are of exceptional universal importance from a historical, artistic, and/or scientific standpoint. The make or break factor for inscription is whether the property is unique, historically authentic, undamaged, and complete. In addition, the property must meet at least one of the ten UNESCO criteria for inscription in the list of natural heritage sites. UNESCO also requires that the following criteria be met: the area must be subject to statutory protection at the time its candidacy is put forward; a core zone and an adjoining buffer zone must be established; development plans are to be produced. It is also essential that the local population be informed and involved from the outset. Based on these criteria, the World Heritage Committee determines whether a property should be inscribed in the World Heritage List. The committee is composed of 21 representatives of various states and is advised by consultants in that the committee commissions expert reports concerning the relevant properties. Candidates for natural world heritage properties are evaluated by the International Union for Conservation of Nature (IUCN) (external link), while world culture site candidates are evaluated by the International Council on Monuments and Sites (ICOMOS) (external link). The World Heritage Committee bases its decisions strictly on the criteria set forth in the World Heritage Convention. While inclusion in the UNESCO World Heritage List entails no additional conditions concerning world heritage properties, it does entail the obligation to abide by the provisions of the Convention. Hence when a property is inscribed in the World Heritage List, the relevant state warrants that it will preserve the uniqueness and integrity of the site for current and future generations. In the event a World Heritage site is endangered, it is entered in the List of World Heritage in Danger (Red List) (external link), whereupon the states affected are required to draw up action plans to avert the relevant danger. Lacking this, UNESCO is entitled to remove the endangered site from the World Heritage list. A first attempt to have the Dolomites inscribed in the UNESCO (external link) (United Nations Educational, Scientific and Cultural Organization) World Heritage List was begun in 1997. In response to a recommendation from the competent Italian ministry, the provinces of Belluno, Trento and Bozen-Südtirol / Bolzano-Alto Adige undertook the project. A survey of the 22 South Tyrol municipalities affected revealed that 20 were in favor of the candidacy, one was in favor with reservations, and a third was opposed to the idea. Most of the municipalities stated that they would agree to the project on the condition that only existing nature parks be put forward as nominated properties. The South Tyrol government agreed to this recommendation and conveyed it to the relevant ministry. But the project ultimately came to naught due to differences of opinion among three of the provinces concerning the demarcation of the parks. A second candidacy initiative was begin in December 2004. This time the Ministry of Culture and the Environment laid down clear guidelines for the nominated properties that were consistent with the World Heritage Convention and had a good chance of succeeding. Pursuant to UNESCO stipulations concerning World Natural Heritage sites, properties were nominated only if they already subject to statutory protection: nature parks, national parks, and Natura 2000 sites; in South Tyrol Sextner Dolomiten / Dolomiti di Sesto (since renamed Drei Zinnen / Tre Cime), Fanes-Sennes-Prags / Fanes-Sennes-Braies, Puez-Geisler / Puez-Odle, Schlern / Sciliar and Trudner Horn / Monte Corno Nature Parks. The project partners at this juncture were Bozen-Südtirol, Trento, Belluno, Udine and Pordenone provinces, as well as the Italian Ministry of Culture and the Environment. The first formal application was filed in September 2005 with the World Heritage Secretariat in Paris. This application, which encompassed 22 protected areas, was composed of a complete dossier, a development plan, and extensive photographic, cartographic, film and literature documentation. In 2006 UNESCO had an International Union for Conservation of Nature (IUCN) (external link) consultant visit the nominated properties and review the application. In the summer of 2007 the World Heritage committee tabled its decision and indicated that the application needed to be completely revised in such a way that the aesthetic, geological, and geomorphological value of the Dolomites were underscored. The Committee also stipulated that the number of Dolomites World Heritage Property components should be reduced. Nonetheless, it was clear to all concerned that the Dolomites were eligible for inscription in the World Heritage List by virtue of these two UNESCO criteria: the site must “contain superlative natural phenomena or areas of exceptional natural beauty;” and the site must exhibit “outstanding examples representing major stages of earth's history”. In response to the Committee’s feedback, the application was completely revised such that the main focus was on the geology, geomorphology, and natural beauty of the recommended areas. The revamped application was prepared by geologist Piero Gianolla from the University of Ferrara, geomorphologist Mario Panizza from the University of Modena, and freelance professional Cesare Micheletti from Trento. 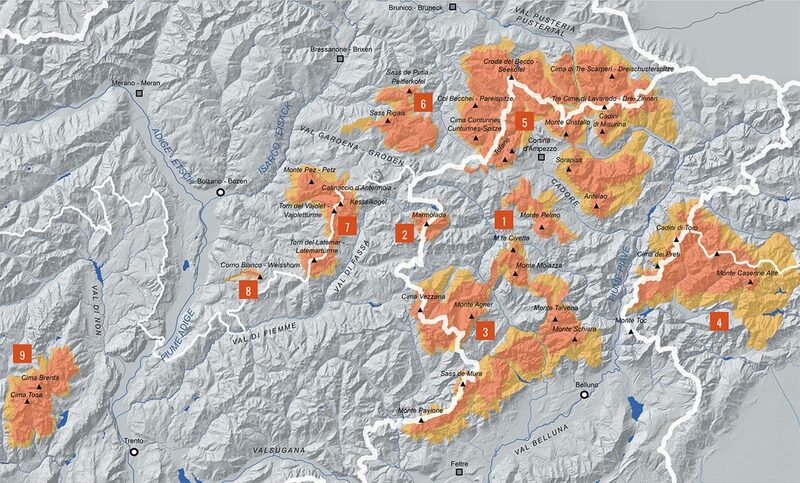 The new application encompassed nine mountain chains spread across five provinces which were proposed as “serial world natural heritage” sites. In South Tyrol, Sexten Dolomites (since renamed Drei Zinnen / Tre Cime), Fanes-Sennes-Prags / Fanes-Sennes-Braies, Puez-Geisler / Puez-Odle and Schlern-Rosengarten / Sciliar-Catinaccio Nature Parks were selected, along with the Latemar mountains and Bletterbach river gorge natural monument. The revised application was submitted to the World Heritage Secretariat in February 2008, and in September 2008 two IUCN consultants visited the nominated properties. They were impressed by the unique natural beauty and diverse geological forms and found that the application proved that the Dolomites deserve to be classified as World Heritage, including from a scientific standpoint. However, the committee also found that the dossier lacked concrete descriptions of the following elements: collaborative management and development procedures; the various protection categories; inclusion of the various government agencies and interest groups; and operational measures. The IUCN consultants found the recommendation to establish a foundation to be a very positive step toward a collaborative approach to governance of the nominated properties. In May 2009 the IUCN annexed a positive expert report to the application, but with a number of conditions. The report classified the Dolomites as a unique worldwide property from the standpoint of natural beauty, geomorphology and geology. Hence at the 33rd meeting of the World Heritage Committee in Seville, Spain on 26 June 2009, the Dolomites were officially inscribed in the UNESCO World Heritage List. As the result of a report submitted by an IUCN technical consultant, a statement of position by Italy’s UNESCO representative Giuseppe Moscato, and an ensuing discussion with members of the World Heritage committee, Italy’s application was approved unanimously, subject to the conditions set by the IUCN. The Italian delegation (comprising Environmental Minister Stefania Prestigiacomo and the various provincial delegates, including provincial councillor Michl Laimer) was extremely pleased on receiving the high distinction. Several requirements to which the signatories of the UNESCO World Heritage Convention are subject. „The Dolomites are of international significance for geomorphology, as the classic site for the development of mountains in dolomitic limestone. The area presents a wide range of landforms related to erosion, tectonism and glaciation. The quantity and concentration of extremely varied limestone formations is extraordinary in a global context, including peaks, towers, pinnacles and some of the highest vertical rock walls in the world. The geological values are also of international significance, notably the evidence of Mesozoic carbonate platforms, or “fossilized atolls”, particularly in terms of the evidence they provide of the evolution of the bioconstructors after the Permian/Triassic boundary, and the preservation of the relationships between the reefs they constructed and their surrounding basins. The Dolomites also include several internationally important type sections for the stratigraphy of the Triassic Period. The scientific values of the property are also supported by the evidence of a long history of study and recognition at the international level. Taken together, the combination of geomorphological and geological values creates a property of global significance." The IUCN furthermore found that the protective measures for the nominated properties complied with UNESCO guidelines and thus met the integrity criteria for natural sites. However, the IUCN report (a) pointed out that in some areas tourism had already reached the admissible limits for a World Heritage site; and (b) underscored the importance of greater cooperation between the various provinces for purposes of achieving harmonized governance and development of the World Heritage. 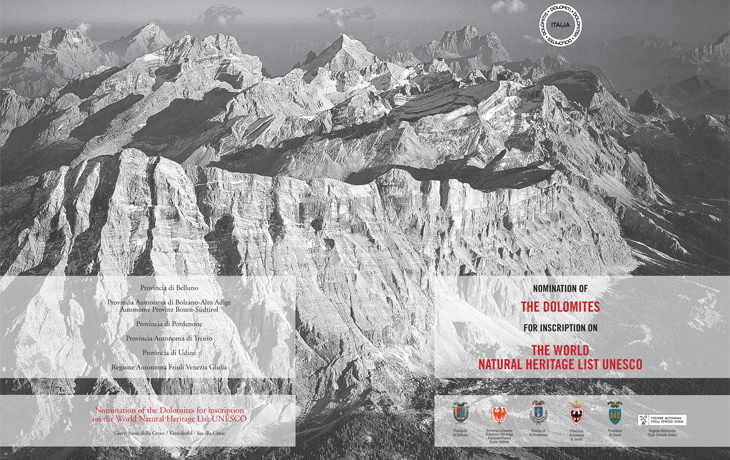 Hence the IUCN recommended that inscription of the Dolomites on the World Heritage List be subject to certain conditions. a comprehensive tourism management strategy is to be elaborated. South Tyrol is inscribed in the World Heritage List under group 5 (“Northern Dolomites”) comprising Drei Zinnen / Tre Cime (formerly Sexten Dolomites) and Fanes-Sennes-Prags / Fanes-Sennes-Braies Nature Parks, along with other mountain ranges of the Belluno Dolomites; under group 6 comprising Puez-Geisler / Puez-Odle Nature Park; under group 7 comprising Schlern-Rosengarten / Sciliar-Catinaccio Nature Park, the Latemar and the Trentino side of these mountain ranges; and under group 8 comprising Bletterbachschlucht river gorge. The other World Heritage sites are as follows: Pelmo - Croda da Lago (1, Belluno); Marmolada (2, Trento and Belluno); Pale di San Martino - San Lucano - Belluno Dolomites - Vette Feltrine (3, Trento and Belluno), Friulian Dolomites and the Oltrepiave mountains (4, Udine, Pordenone and Belluno) and the Brenta Dolomites (9, Trento). The so called core zone, which is the actual World Natural Heritage, covers a surface area of 141,903 hectares, whereas the so called buffer zone, which is adjacent to the core zone and is intended to afford additional protection, covers a surface area of 89,267 hectares. The core and buffer zones are composed of protected areas such as nature parks, national parks, and Natura 2000 sites. These were the elements that formed the basis for the candidacy. On 13 May 2010 the five provinces and two regional governments established the Dolomiti-Dolomiten-Dolomites-Dolomitis UNESCO Foundation for purposes of joint governance of the Dolomites UNESCO World Heritage Site. Establishment of this foundation met one of the conditions that UNESCO had set for inscription of the Dolomites on the World Heritage List. The foundation’s mission is to help achieve sustainable development of the Dolomites UNESCO World Heritage Site by promoting cooperation among the provinces. Organizing research, exhibitions, lectures, conferences and other events. The Dolomiti-Dolomiten-Dolomites-Dolomitis UNESCO Foundation works closely with the “operations centers” that have been established in the five provinces and has its own staff. The Foundation’s official headquarters for tax purposes are in Belluno, Italy. The presidency of the foundation is held for three years in alternation by the five provinces, whereby the order in this regard is determined by the alphabetical sequence of the province’s names. The General Secretary of the Foundation, who is appointed for a three year term by the executive board, is in charge of implementing the goals and requirements defined for the Foundation by the executive board and management board. The executive board is composed of the competent assemblymen or assessors of the five provinces. The board sets the Foundation’s overall administrative strategy, elaborates its annual program, appoints the General Secretary, and is in charge of regulatory harmonization and development of the Dolomites UNESCO World Heritage Site. The Dolomiti-Dolomiten-Dolomites-Dolomitis UNESCO Foundation chairmanship is held in rotation for a three term by a member of the executive board, whereby the sequence of office holders is determined by the alphabetical order of the province names. As the legal representative of the Foundation, the chairman signs Foundation contracts and other legal documents and also effects payments on the foundations's behalf. In addition, the chairman oversees the Foundation’s management activities, and in conjunction with the general secretary is in charge of ensuring that executive board decisions are duly implemented. The deputy chairman is the executive board member whose province follows that of the current chairman in alphabetical order. The founding members appoint anywhere from one to three auditors for a three year tenure. The auditors’ mission is to monitor Foundation governance and produce a report concerning the Foundation’s proposed budget and its annual financial statements. The auditors also advise the executive board on financial matters. The Foundation’s general assembly is composed of its founding members, as well as representatives of local municipalities, protected-area authorities or research institutions – the goal being to ensure that the local population is factored into the equation. The Foundation chairman calls a meeting of the general assembly at least once a year in order to discuss UNESCO World Heritage related matters, to convey information, and for general networking purposes. For further information, as well as an application form to become a member of the Foundation’s general assembly, visit the Dolomiti-Dolomiten-Dolomites-Dolomitis UNESCO Foundation website (external link), which is in charge of this process. The scientific advisory panel is composed of between three and five members, who are appointed by the executive board. The panel advises Foundation management on technical and scientific matters. All imortant informationon on the brand logo of the Fondazione Dolomiti – Dolomiten – Dolomites – Dolomitis UNESCO will you find here (external link). UNESCO’s Operational Guidelines 11/01 stipulate that a management plan is to be drawn up for each World Heritage property describing how the universal value of the property can be maintained. Such plans had already been drawn up for much of the South Tyrol World Heritage areas for Natura 2000 (external link), which is a Europe-wide network of protected areas. The management plans for Bletterbach river gorge natural monument and the Latemar mountain region were elaborated on inscription of these entities in the World Heritage List.